The Ladder of Divine Ascent Icon showing monks ascending to Jesus in Heaven, top right, while demons attack them. 12th century, Saint Catherine's Monastery. In the Letters of Paul eternal life is achieved through faith in Jesus, with sin as an obstacle along the path. In Christianity, eternal life traditionally refers to continued life after death, as outlined in Christian eschatology. The Apostles' Creed testifies: "I believe... the resurrection of the body, and life everlasting." In this view, eternal life commences after the second coming of Jesus and the resurrection of the dead, although in the New Testament's Johannine literature there are references to eternal life commencing in the earthly life of the believer, possibly indicating an inaugurated eschatology. In New Testament theology, in addition to "life" (zoe, i.e. ζωὴ in Greek), there is also a promised spiritual life sometimes described by the adjective eternal (aionios i.e. αἰώνιος in Greek) but other times simply referred to as "life". In the New Testament, life is not an inherent part of human existence, but is a unique gift from God, based on the model of the Resurrection of Jesus. In Christian teachings, the Resurrection of Jesus is a unique event through which death was conquered "once for all". As a consequence of the death and Resurrection of Jesus, Christians can experience eternal life both at the present as well as the future. In both John and Paul the possibility of attaining eternal life and avoiding the wrath of God is dependent on believing in Jesus, the Son of God. For John abiding in Christ involves love for one another, as in John 15:9-17, and John 5:24. The existence of divine love in believers, then facilitates the influence of the gospel on the world, and lead to widespread salvation. 1 John 3:14 then manifests "the already but not yet" acquisition of eternal life by referring to the acquisition of eternal life as a once for all (ephapax) event, and the role of love in attaining it: "We know that we have passed from death to life, because we love each other. Anyone who does not love remains in death", somewhat reminiscent of the words of Jesus in John 5:24. Catholic Christians teach that there is a supernatural realm called Purgatory where souls who have died in a state of grace but have yet to expiate venial sins or temporal punishments due to past sins are cleansed before they are admitted into Heaven. The Catholic Church also professes a belief in the resurrection of the body. It is believed that, before the Final Judgement, the souls of all who have ever lived will be reunited with their resurrected body. In the case of the righteous, this will result in a glorified body which can reside in Heaven. The damned, too, shall reunite body and soul, but shall remain eternally in Hell. Jehovah's Witnesses believe the word soul (nephesh or psykhe) as used in the Bible is a person, an animal, or the life a person or animal enjoys. Hence, the soul is not part of man, but is the whole man—man as a living being. Hence, when a person or animal dies, the soul dies, and death is a state of non-existence, based on Psalms 146:4, Ezekiel 18:4, and other passages. Hell (Hades is not a place of fiery torment, but rather the common grave of humankind, a place of unconsciousness. 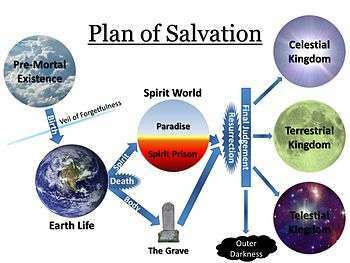 After the final judgment, it is expected that the righteous will receive eternal life and live forever in an Earth turned into a paradise. Another group referenced as "the little flock" of 144,000 people will receive immortality and go to heaven to rule as Kings and Priests. Jehovah's Witnesses make the distinction that those with "eternal life" can die though they do not succumb to disease or old age, whereas immortal ones are absolutely immortal and cannot die by any cause. Even God himself wouldn't be able to kill them. They teach that Jesus was the first to be rewarded with heavenly immortality, but that Revelation 7:4 and Revelation 14:1, 3 refer to a literal number (144,000) of additional people who will become "self-sustaining", that is, not needing anything outside themselves (food, sunlight, etc.) to maintain their own life. Members of the The Church of Jesus Christ of Latter-day Saints also believe that, prior to their mortal birth, individuals existed as men and women in a spiritual state. That period of life is referred to as the first estate or the Pre-existence. Latter-day Saints cite Biblical scriptures, such as Jeremiah 1:5, as an allusion to the concept that mankind had a preparation period prior to mortal birth: "Before I formed thee in the belly I knew thee; and before thou camest forth out of the womb I sanctified thee, and I ordained thee a prophet unto the nations". ↑ Wright, N.T. (2006). Simply Christian. San Francisco: HarperSanFrancisco. p. 219. ISBN 0060507152. .
↑ D. A. Carson, The Gospel According to John (Apollos, 1991), p. 556. ↑ Eerdmans Dictionary of the Bible summarizes this as follows: "The NT searches for a balance on eternal life between present and future - the believer has passed in Christ from death to eternal life, but this remains to be fully realized in God's future, specially in the Resurrection and new creation at the eschaton". ↑ D. A. Carson, The Gospel According to John (Apollos, 1991), p. 256. ↑ "Is There Life After Death?". The Watchtower. July 15, 2001. ↑ "What Really is Hell". The Watchtower. July 15, 2002. ↑ "The Watchtower", 1 April 1956, 219, "Question From Readers"
↑ "Jeremiah 1:5". Bible.cc. Retrieved 2010-11-04. ↑ "Section 76 lds.org". Scriptures.lds.org. Retrieved 2010-11-04.